“የዜግነት ፖለቲካ” = የነቴዲ አፍሮ "ሃበሻዊት ኢትዮጵያ”? “የዜግነት ፖለቲካ” የሚባለው በርግጥም የዜጎች ፖለቲካ ነውን? የፈረስ ጫማን ለሰው እግር ..? (ጉለሌ ፖስት መጽሄት). “የዜግነት ፖለቲካ” = የነቴዲ አፍሮ "ሃበሻዊት ኢትዮጵያ”? “የዜግነት ፖለቲካ” የሚባለው በርግጥም የዜጎች ፖለቲካ ነውን? የፈረስ ጫማን ለሰው እግር ..? (ጉለሌ ፖስት መጽሄት - Jan, 2019). “የዜግነት ፖለቲካ” የሚባለው በርግጥም የዜጎች ፖለቲካ ነውን? — የፈረስ ጫማን ለሰው እግር ...? 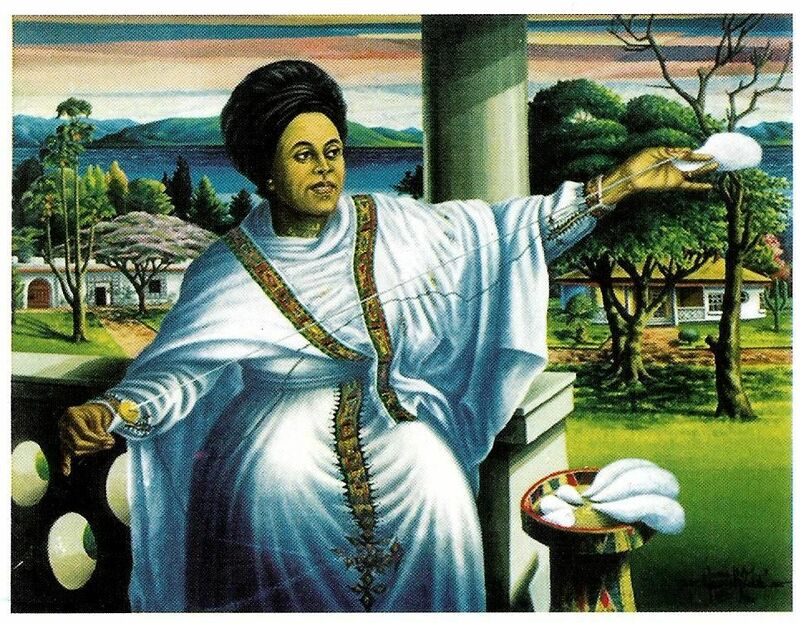 photo: Artist Afework Tekle's 'Mother Ethiopia'. የዜግነት ፖለቲካ ምን ዓይነት ፖለቲካ ነው? ግርማ ጉተማ (አባጨብሳ) [Article appeared in 'Gulele Post', Jan, 2019]. Re: “የዜግነት ፖለቲካ” = የነቴዲ አፍሮ "ሃበሻዊት ኢትዮጵያ”? “የዜግነት ፖለቲካ” የሚባለው በርግጥም የዜጎች ፖለቲካ ነውን? የፈረስ ጫማን ለሰው እግር ..? (ጉለሌ ፖስት መጽሄት). I am Horus. I hate to mince words. Also, I hate lazy minds. Tribalism is chaos. It is also chaotic mind. Here is a tribal chaotic mind attacking the word Habasha and artist poet Tedy Afro yet using the Ethiopian language Amharic. This is not only a chaotic political psychology, it is a crisis of perception. For you information, the word Gulela' is a Semitic word. There is no Oromo word called gulela'. If there is one, tell us what it means. There has never existed a people called Gulela'. This tribal chaotics, borrow culture and languages like nobody's business and yet try to lecture us about Ethiopia (Medre Habasha). Ethiopia is Habasha. Habasha is Ethiopia. Amharic is An Ethiopic language made up of many Ethiopic languages. Those who hate Amhaic must not use it and talk to themselves with their own tribal language. Ethiopia will establish a citizen formed free modern democracy. Ethiopiansim is civic nationalism, it is the identity and self-expression of every free Ethiopian citizen. Those who don't want to an Ethiopian citizenship, then that is their right not to vote or participate in Ethiopian democratic politics. The very word 'identity' has nothing to do with the word tribe or ethnos. Identity is a word that comes from being human being or Sew or Seb. Tribalism a primitive backward method of organization where people who are not related genetically are forced into falsely claimed genetic relativity. This is the chaotic mind's fakery. To attack the idea of individual liberty and the idea of a free and sovereign individual human being is the ultimate bankruptcy and chaotic vacuum of tribal ideology called by 1001 names. Again, if you don't like Amharic don't use it. Talk and write your own language. You have no right to tell me what language I must use or or not use. Tribalism is Chaos. That is all.